Sony’s PlayStation Plus is a subscription-based service that allows members to get weekly and monthly access to discounted games on the PlayStation Network, as well as the occasional free game. Sony has calculated that the $50/year service has granted thousands of dollars in savings. Everyone loves free games, but nobody likes a free game that’s a piece of HDD-hogging garbage. 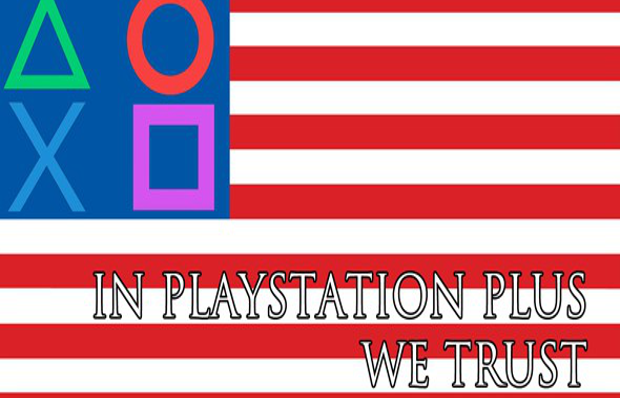 “In PlayStation Plus We Trust” is a new weekly feature outlining the new free addition(s) to the Instant Game Collection to help you decide whether that newest freebie in the Store is worth your time. Some of you may be delighted by this week’s offering: Jet Set Radio! This HD remaster of a Dreamcast classic is positively oozing with charm–from its delinquent characters to its exaggerated art style and overall absurd vibe. For the uninitiated, this is a Tony Hawk-lite rollerblading game with a graffiti element. Each stage is a small-to-medium contained area with plenty of opportunities to do tricks, grind on rails, or get caught by police. Of course, the core objective is to tag everything in sight, preferably while performing tricks. It’s very silly and over-the-top, but carries enough personality to be a passing amusement. Unfortunately, the controls have not necessarily aged well. I may be jaded, having just come away from tighter games like The Last of Us, but things simply don’t feel as well-put-together as they should. The dated controls make the game come off as clunky, unresponsive, and annoying. Some tricks are borderline-impossible to perform, some trick areas are difficult to land, and your character inexplicably slows down to a stop performing some, while racing forward on others. These issues are noticeable at best, and glaring at worst. Jet Set Radio is fun for a while, but you’re likely to get bored with a title that does not stand the test of time. In addition to the discounts you get on preordering the PLAY promotion games, there are a few other deals to consider. This probably isn’t one of the ones you’ll want to get in on, as it’s a PlayStation Move-controlled game, and only that. It does carry the novelty of being able to play as a magic caster, and there are some fun areas, but this is best left for those of you who really enjoy motion-controlled games. That said, you’re not losing much by giving it a shot, as it’s taken a 50% discount down to $5. If you’re interested, do your research and go from there. Here are a bunch of carnival games to, once again, enjoy with the assistance of PlayStation Move. Unless you have kids, this is probably a poor choice; the game is quite literally made up of a bunch of carnival activities requiring the Plus wand. If that floats your boat or you have easily entertained tikes, it does that pretty well. Otherwise, $5 might not be enough of a deal to entice anyone. Chalk up another one for PlayStation Move with this motion-controlled offering. In Datura, you’ll move through an atmospheric forest with plenty of mysteries to unravel, including that of the Datura flower and the reasons behind the main character’s sudden presence in the forest. This is likely the best you’ll do this week in terms of Plus deals, but even this has its issues, particularly with the controls. If you really want a Move game, maybe give this a shot for the acceptable $2.50 price tag. Not quite motion-controlled, but exclusively touch screen controlled; that’s pretty much the parlor trick of Draw Slasher, and it’s not a bad one. As a ninja, everything you do is controlled by the Vita’s touch display (it’s apparently an iOS port). It’s $3.19, so for that low price it might be worth a shot if you have money to throw around, but as with the other deals this week, make sure you do your reasearch first, as this has received fairly middling reviews.